Millie Hinchliffe lives a near-perfect existence, tucked away with her loving fighter-pilot husband in their picture-postcard cottage in the glorious English countryside. As a mother, artist, classical pianist and avid gardener, Millie has it all. But when ‘Hinch’ goes missing with a beautiful heiress over the Atlantic in a bid to set a flying record, her world is shaken to the core. Heartbroken and facing ruin, she questions the validity of messages she receives from the ‘other side’— messages that her husband is desperate to help her. In this suspenseful tale of unconditional, love, desperate loss and wild adventure, Hinch charges Millie with an extraordinary mission: Put a stop to the British Airship Program and prevent another national tragedy. Another riveting tale from David Dennington, author of The Airshipmen. This time, he cleverly weaves together a couple’s amazing love and the temptation it faces with the drama of a transatlantic flying record attempt and a spine-tingling psychic connection from beyond the grave that becomes the only hope of preventing a horrific aviation disaster. 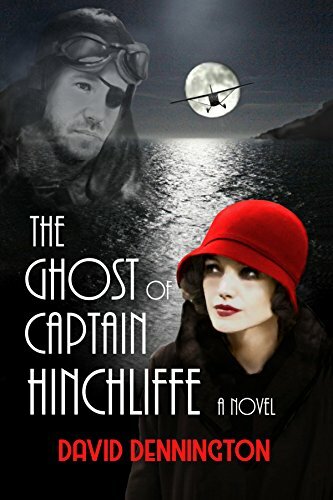 It’s an intriguing recipe that makes it hard to put down The Ghost of Captain Hinchliffe. David Wright, former journalist with the Daily Mirror, London.